Some acts resonate with bonafide bass heritage. It's nothing tangible. It's not something you can wear or say. It's certainly not something you can buy. It's about roots. Something Nick Hill and Gavin Harris are reminded of every day. The Loadstar laboratory is the very same studio Roni, Die and Krust established their massively influential Full Cycle brand almost 20 years ago. The legacy isn't lost on them. Bristol-born Gavin was a card carrying bass addict before he even knew it. Rave tapes were common amongst kids as young as eight in the city. Older brothers and sisters sharing the knowledge with wide-eyed passion. By the time Gavin was 15 he was sneaking into illicit venues in the city's notorious Stokes Croft district, mesmerised by the on-going 'Bristol sound' experiments Roni and co were making. Nick's journey into drum & bass couldn't be more different. Brought up 60 miles due east in the sleepy, well-heeled town of Newbury, his route came via a classic Chemical Brothers epiphany. By the time he logically progressed to Bukem he thought he was the only boy on the planet who understood and appreciated the work of Good Looking. He was certainly the only boy in his school with such a deep D&B connection. Loadstar thrives off such contrast. Nick, a classically trained musician with theory dutifully drilled into his cortex from the age of six, and Gavin, an engineering wunderkind who knows mixdowns like a cabbie knows London, complement each other in many ways. Of course neither of them knew this when Gavin first booked Nick for a D&B night he was running in Liverpool. Two university students with a shared love for drum & bass and a few releases to their name, they knew they had something in common - but it wasn't for a few years until they really capitalised on the creative potential of a partnership. Armed with strong solo profiles as Xample and Lomax, Gavin and Nick were reunited in Bristol. At a drum & bass night, naturally. 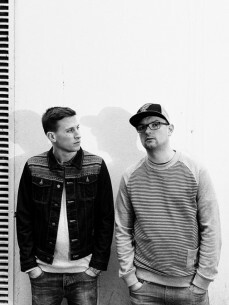 While the duo maintained their individual output with big releases on labels such as Spearhead, Critical and Ram's new talent celebrating imprint Frequency, behind the scenes something much bigger was developing: Something that consolidated their extensive discographies (totalling well over 100 records between them) and elevated their sound to an exciting new level - Something we now know as Loadstar. The name Loadstar came about through an in-joke about a dodgy old Akai sampler and a box of old Commodore 64 games gathering dust in Gavin's studio. The sound they launched with has a much better story, though - It was 'Link To The Past'. One of this decade's biggest drum & bass tunes, it sang to every shade of D&B DJ and still commands rewinds to this day. Thanks to the distinctively savage, elongated, distorted bassline Loadstar literally tore into the scene. In the three years that have passed since that scene-scorching debut, Loadstar's currency gets stronger and stronger: Each release showcasing a stylistic range that pushes them deeper into every corner of the dance. From the daytime Radio1-listed turbo-bass ballad 'Space Between' to the demonic, Prodigy-level aggression of 'Vatican Roulette' via the Benny Banks-fronted 'Black & White', their exciting debut adventure into new tempo territories, Loadstar releases are as excitingly unpredictable as they are expertly produced. Stretching themselves deeper into the dance again, late 2012 saw Loadstar launching their own live show. A complete audio/visual spectacular, the duo now enthral even larger crowds with their unique combination of their own material and sneaky references to the wider world of electronic music. Powered by Ableton, Pioneer MIDI controllers, synths, a Launchpad and some of the most captivating visuals seen this side of Andy C's Alive show, few things say 'next level' like a live show of Loadstar proportions. Somehow amid the singles, the live show, and remixes of household names such as Rudimental, Noisia, Breakage, Chase & Status and Wolfgang Gartner, they've also created their debut album: 'Future Perfect'. Eschewing the standard concept of squeezing out an LP in two months, they've been writing 'Future Perfect' since Loadstar first began. The advantage of time has ensured each of the long player's 22 tracks are as impeccably produced and relevant as they can possibly be - Spanning from Scrufizzer-fronted hip-hop heaviness ('Do You Feel Me') to euphoric, laser-grabbing electro-bass hybrids ('Losing You'), 'Future Perfect' showcases their broadest range yet and embraces everything about bass music that scintillates and satisfies while remaining wholly true to their drum & bass roots. With an eye on the future and a strong link to D&B's past, Gavin and Nick find themselves in an exciting position that pitches them comfortably in all party environments; from mainstage at major festivals such as Pukklepop and Creamfields to Bristol's finest subterranean dancehalls, Loadstar resonate with nothing but bonafide bass heritage.